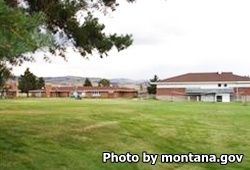 Riverside Youth Correctional Facility is located in Boulder Montana. It is juvenile detention facility for over twenty youthful females (aged 10-17). Inmates are provided substance abuse treatment and required to attend eight hours of schooling every weekday, all year round. Offenders can obtain a diploma while incarcerated here. This facility puts an emphasis on critical thinking skills and problem solving, as well as taking responsibility for ones actions. All visits must be scheduled in advance by calling the inmate's case manager at (406)-225-4516. Visits are one hour in duration and occur on Fridays, Saturdays, and Sundays from 2pm-3pm. You must be on time for your scheduled visiting appointment, if you are late you will not be allowed to visit, early arrivals must wait.